Small, immaculately maintained and possessing one of the city’s finest dining rooms, the Brandenburger Hof is perhaps the most stylish hotel in Berlin. As soon as I arrived at the entrance, on a quiet street not far from the Kurfürstendamm, I was aware that this was a special place. The doorman rushed to open the door of my taxi… and smiled. I was to see many smiles during my stay at the Brandenburger Hof. It pleases me when members of staff attend to my requests with friendliness. And as soon as I was into the hall of what was (before its conversion in 1991) a mansion-block of flats, before me was another attractive feature of the establishment: the wonderful blend of styles. Who would have thought that the austere aesthetic of the Bauhaus could be used so effectively within the opulence of turn-of-the-century stucco? Not I, certainly. Yet I was much taken by this marriage of spare, minimalist furnishing and the high ceilings, columns and cornices of the 1900s bourgeoisie. And my suite was a happy consummation of the union. Cream walls and curtains, brown woodwork and carpets, polished chrome and black leather and modern prints in silver frames hanging from the original picture rail – the effect was spare, cool and elegant. 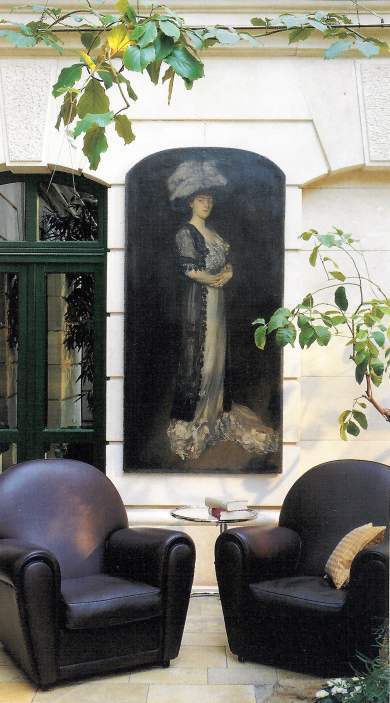 A small hallway led into the sitting room with French windows overlooking the hotel’s inner courtyard. To the right was a door to the cloakroom; to the left was an archway to the bedroom. A dressing room – which lighted automatically upon my entrance – held the safe. In the bathroom white tiles gleamed around the large tub and the separate shower. With the windows open to allow in a cooling breeze, I sat on the sofa and was soothed by the song of the birds in the trees below. All this was had for the attractive price of 450 euros a night. Suites here are named after operas. Mine, on the third floor, was Dalibor. I have to confess that this work by Smetana was new to me. But I had the opportunity to make its acquaintance, for it was playing on the cd machine as I was shown in – a small example of the sort of attention to detail of which I thoroughly approve. I also approve of the sort of housekeeping which ensures that everywhere looks spotless at all times. Clearly, the Brandenburger Hof is a very well-run hotel. Top marks to the Manager, Markus Otto Graf. Breakfast (included in the price of the room) is had in the Wintergarden, a conservatory around the sides of the courtyard. On a bamboo chair amidst exotic greenery, I tucked into fish, cheeses and cold meats (all of high quality) from the buffet and looked out onto the Japanese garden. Limoges porcelain in green and white and young waitresses in grey and white added to the sense of calm refinement. Here and there pieces of polished antique furniture added a moment of glowing warmth. I always make an effort to dress well for breakfast, and here the effort felt thoroughly worthwhile. 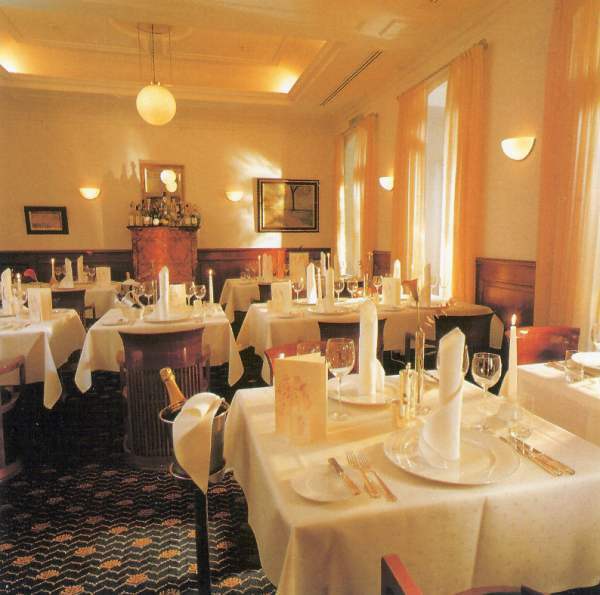 Dinner, too, can be had in the Wintergarden, but the hotel’s Michelin-starred restaurant is Die Quadriga. In this small room chef Bobby Bräuer presents giant culinary achievements. Mr Bräuer is from Munich and is in his 40s, although he looks much younger. His approach is to take the finest ingredients, treat them with respect, combine them with flair (but within the best and most sensible French traditions) and then present them on the plate in the manner of a master painter. The result of all this hard work and ability is a short, attractive menu and dishes which are as delightful to the eye as they are to the palate. I tried lobster (excellent), sea bass (perfectly timed, succulent, with a superb cream sauce), delightful veal (with kidney and peas) and lamb (a visually stunning plate, let down by over-salting). The cheeses and the puddings were up to the same remarkable standards. German wine does not just feature on the wine list: it is the wine list. Indeed, this list is a monument to the greatness of German wine. To have assembled these 850 offerings is a fine achievement. Among the 450 rieslings are evidences of the ageing potential of both the sweet and the dry versions. Of the former, you can try a 1937 Trockenbeerenauslese at 5,320 euros. Of the dry, you might be tempted by an 1897 – price on request (Riesling Cabinet, Steinberger, Hattenheim, Hessiche Staatweingüter – Kloster Eberbach). Sommelière Romana Essenberger showed her expertise by bringing to my table some glorious bottles. And none was more glorious than the opening 1971 Riesling Spätlese, a full-bodied tribute to the aromas and flavours of the ash tray and petrol (Rauenthaler Langenstück, Verwaltung der StaatsweingüterEltville, Rheingau – 26 euros). Then two wines from Baden: a refreshing citrus fruit sauvignon blanc (Karl Johner, 2002 – 58 euros) and a firmly structured chardonnay (Spätlese, Bercher, 1999 – 57 euros). Red wine has never been this country’s great strength, but my merlot from the Pfalz was a decent effort, medium-bodied with plenty of black fruit (Siegrist, 2000 – 60 euros). The concluding wine displayed the gorgeous combination of sweetness, piercing acidity and low alcohol which makes German pudding wines such gems (Musbacher Eselhaut, Riesling Eiswein, Müller-Catoir, Pfalz, 1998 – 76 euros, half-bottle). 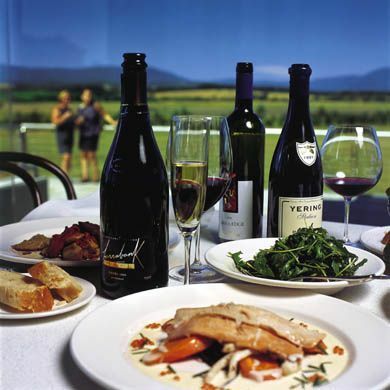 If you need to be convinced about the wonders of German wine, this is the restaurant to visit. If you are getting the sense that I enjoyed myself at Die Quadriga, you are right. 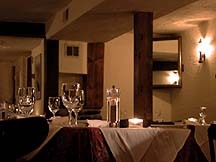 I liked the food and the wine, I liked the service, I liked the room and its German Impressionist paintings – I even liked the chair in which I sat (made in cherry wood from a 1904 design by Frank Lloyd Wright). Berlin – now that its building and renovation programme is finally nearing completion - is a wonderful destination. Its museums alone are worth the journey. 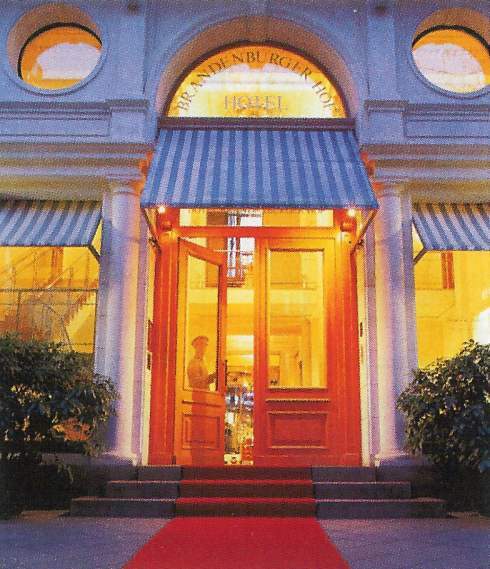 And waiting to offer hospitality of rare sophistication and refinement is the Brandenburger Hof. Eislebener Strasse 14, 10789 Berlin, Germany.